Have you ever fallen asleep in Savasana? I rarely do, but one of my colleagues seems to doze off regularly. Although we don’t attend the same weekly class, we attend workshops together. If I’m in his vicinity during Savasana, I’ve heard him softly snoring each time. Me, I’m just the opposite. I lie down and let go as instructed. But, while my body rests, my mind continues to whir for a few minutes. So, unless we do a luxuriously long Savasana, I never quite reach mental stillness. When I occasionally do drift off, I know it’s not ideal, but I nevertheless enjoy the moment of deep relaxation. I feel very refreshed after—who knows?—a minute or two of unconsciousness. Was I really sleeping? I always spontaneously wake before the teacher breaks the silence. The gap between deep relaxation and light sleep can be narrow. It’s no easy trick to drop away just short of sleep, where the body is utterly at ease and the mind, awake and observant. In his much-publicized book The Science of Yoga, William Broad cites the case of a woman who fell asleep doing Paschimottanasana*. Upon waking, her legs were weak, numb, and non-ambulatory. The diagnosis: damaged sciatic nerves. Half a year later, she still couldn’t walk without assistance, and doctors predicted that she’d never regain full function. Falling asleep in Paschimottanasana?! Who the heck falls asleep doing asana, a deliberate, physical practice? Likewise, it’s antithetical to sleep while bicycling, eating, or driving a car. Injury is likely if one falls asleep during almost any non-couch-potato activity. I’m curious to know how long she slept—and her experience level. If tight in the hamstrings, it’s possible that sciatica might result, but are such beginners comfortable enough to sleep in the pose? If experienced and limber, with torso draped over thighs, sleep might come easily—but only if extremely sleep-deprived/attention-deficient. Asana is not about zoning out! During my teacher Louie Ettling‘s summer retreat (all day for six days), some students experienced insomnia. Perhaps the change in their normal routines upset their biorhythms, or perhaps the asana was overstimulating. 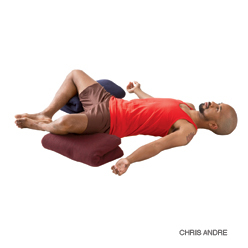 How much does asana (whether the sequencing or the poses themselves) affect sleep? Perhaps such correlations are best studied in overnight retreats, where there are fewer intervening variables. Here, one might leave the studio calm and composed, only to get riled up by traffic, a sick child, work stress, or an argument before bed. So, if someone says, “Wow, I couldn’t sleep because of the backbends we did,” it’s not necessarily true. Assuming no intervening variables, is the insomnia due to the asana or to response to the asana? The former is purely physical and physiological, while the latter is distracting mental commentary, whether about the asana (from “I made a breakthrough!” to “Did I tweak my back again?”) or about other preoccupations. If insomnia strikes, what should be done? It’s common to try focusing on the breath and other yoga/meditation techniques to still the mind. I wonder about this approach: Might it be a bad habit to “train” oneself to fall asleep doing focused breathing? Might this foster a Pavlovian effect? Sleep remains a great mystery and, yes, a great necessity of life. *Walker, Melanie, Gregg Meekins, and Shu-Ching Hu, “Yoga Neuropathy: A Snoozer,” The Neurologist, vol 11, no 3, May 2005, pp 176-78. Without a subscription, I could access only the abstract. If you have full article access, please share! Falling asleep in Paschimottanasana?! That is ridiculous. Of all asanas! I, for one, loooove savasana. If I’m teaching a class I love to let the students get a good long one in. Sometimes it’s the only relaxing they get in during their day. Re: Sleep during savasana. To my knowledge, I have not fallen asleep during savasana. Most of the time my mind is quietly puttering along, thinking of this that or the other thing while I listen to someone snoring next to me. It’s like I *know* that this isn’t the place to fall asleep, but I can follow that train of thought really deep. I have completely zoned out during a guided 64 points of light practice, “waking up” when the room has fallen to the silence of savasana. To compare, on a typical night, I usually fall asleep within about 5 mintues of shutting off the light. So perhaps most savasna sessions just aren’t long enough for my system to make that transition from mindful rest to sleep? Re: Falling asleep during Pashimottanasana. I had a similar reaction when I read that section in the book – an anomoly. I have done a 10 minute forward folds several times as part of a Yin session and I can safely say that I had NO desire to fall asleep. None whatsoever. But there are few poses where I do feel very restful, where I enjoy closing my eyes and just kinda let my mind drift away. I supposed I *could* fall asleep, but that would be awkward and embarassing. So I don’t. RE: Workshops. I’ve experienced insommnia after a workshop session, but attributed to the style of yoga I’m practicing (ashtanga or vinyasa) and the time of night the session was held (6:30-830pm). A very energizing sequence that isn’t best done 2 hours before I hit the sack. I also don’t sleep well in strange places with strange noises. I’m a very light sleeper (my dogs collar tags jingling will wake me up), so I struggle when sleeping in odd places. I’ve taken to using earplugs when traveling and have found relief there. Ultimately I think there are so many factors to take into account on how a person will react to the above that to pin something down would be problematic. As a society, we tend to be short on sleep (backed up by statistics on falling asleep while driving) and over caffinated/over sugared. We cram our days full of stuff, but never add in time for rest. I think the symptoms of falling asleep during savasana, poses, or breathing exercises are more a symptom of sleep depravation than a function of anything else. The function of insommnia could be the style of yoga, time of day practicing, or even what the person consumed earlier in the day. Just my idle thoughts. Good post today! I can’t fall asleep in savasana. I can’t even fall asleep flat on my back in bed! I think it’s because I now associate that position with savasana and remaining mentally alert. When it is time to sleep, I have to curl up on my side. I’ve definitely trained myself to associate different body positions with different mind states, inadvertantly, but it works. Luci, I love reading your blog, and often think about my practice or my teaching in new ways from something you have said. I can’t help but think of all the people who have difficulty walking who have never done a yoga pose. Anything done without awareness is hazardous to your health. I don’t know what happened to me in my Savasanas today and yesterday, but I went into a different zone altogether. Could have been due to the 2 days of Bikram doubles… but I just wrote about it so reading your line: “The gap between deep relaxation and light sleep can be narrow,” reminds me of the (spiritual) shift i felt. It’s on my http://www.bikramyogamusings.com blog, poasted Aug 14, if you wanted to take a read and let me know your thoughts… cool post. Previous Previous post: Cell phones in yoga class? Are you kidding me?